AG Not only does the sight of it produce awe and delight, but the idea of it invites questions about beauty. Why, for example, does an object that has been shrunk to a twelfth of its size have charm, while a twelvefold magnification of the same thing would not? How is it that scores of its household objects and features—wineglasses, mother-of-pearl, ivory and marble bathrooms, damask wall-coverings, a motorcycle and sidecar, a knife-cleaning machine—are at least as beautiful to behold as the paintings on its walls and ceilings, indeed, usually more so? Much of the awe that it inspires derives from the industry and ingenuity of the 1,500 or so artists and craftsmen who made it. It is only five feet high, but has working plumbing, electricity and lifts, a garage of cars with engines that run (and would allegedly give 20,000 miles to the gallon), and a level of detail that stops just short of the microscopic. The monograms on the linen took a seamstress 1,500 hours to sew; the buttons on the servants’ pillowcases are almost invisible; the Purdey shotguns break and load (sources differ as to whether they would fire); the bottles and jars contain what their labels say they do—such as Ch. Margaux 1899, Oxford marmalade or sticks of barley sugar. There are even mice in the kitchen mousetraps. It’s no Pyramid of Giza, but it works for me. GB Can you remember the first time you ever saw it? Has the aesthetic experience of it become more complicated for you since then? AG I first came across it in an illustrated book, published in 1988, by Mary Stewart-Wilson, and one of the first things to enchant me was the ingenuity of using hairs from a goat’s ear to serve as toothbrush bristles. Unless you already know about the tiny detailing of what is in it, you probably wouldn’t get so much out of being in the presence of the house itself. I was disappointed that you couldn’t get closer to it when I first saw it in Windsor Castle a few years later. There is now, naturally, an online tour, which is a useful supplement to photographs, because you can enjoy the illusion of moving around inside it. 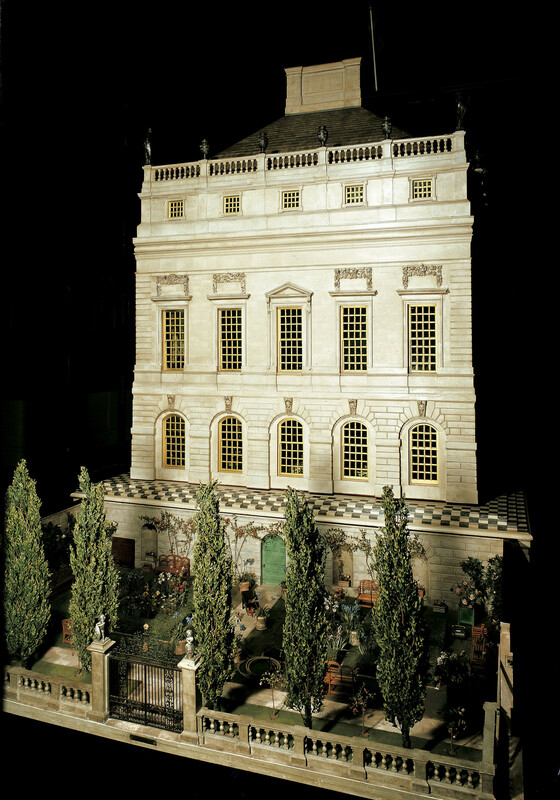 As far as I know, though, there has been no attempt to digitise the contents of the library, which contain many works composed for the dolls’ house, often handwritten by the authors into the tiny books—by Chesterton, Robert Graves, Yeats, Edith Wharton, Aldous Huxley, Hardy, Somerset Maugham, and many others, most of whom are now forgotten. It may well be that some of its treasures will stay out of sight forever. GB It’s so extravagant. Is part of the appeal camp? Do you think that something can be camp and genuinely beautiful at the same time? AG Camp has become a concept of such aesthetic sophistication that it is now largely beyond me. In the senses that the term had when the house was built (that is, 1921-24), I don’t think it is camp. First, and easiest, it is not even really effeminate; indeed, in terms of gender stereotypes, I’d put it in the male camp (no pun intended), because it evokes and required a nerdish devotion to the accumulation of equipment. The other main connotation of “camp” at the time was exaggeration to the point of affectation: something camp is overblown, and thereby fails to be anything except laughable or coarsely entertaining. Now, miniaturisation and detailing have in this house indeed been taken to the greatest extremes that were possible in the 1920s. And it is plush and luxurious, again to an extreme, because it is a house for a king and queen. But are we to suppose that if only it had been less ingenious, less complete, or to have represented something less royal, it would have scored higher on some scale of beauty? That is hard to swallow, so I’m going to say that it is not overblown, and therefore not camp. It is a little over-decorated for my taste—there’s too much on the ceilings, and sometimes too much gilt—but that would be true if it were a full-size house. GB Are there any individual elements you find particularly beautiful? AG For some reason, the bathrooms work best for me, perhaps because of the light and materials. They are also less fussy than some other rooms. The marble chimney piece in the saloon works well: it is one of the things that is, in photographs, indistinguishable from a full-size object—I’m not sure exactly which visual cues give away some of the others. There’s also a table in the saloon with an inlaid marble top which is a particular pleasure. It’s one of the few objects that was not made for the house, and is believed to be an 18th century miniature. GB Do you think that this was a trivial thing for such a great architect as Lutyens to work on? AG There must have been a danger that it would turn out to be. But the effect achieved has justified his decision to do it. When it was first shown, the Times called it “a dangerous sight for half-believers in magic,” and wrote that it appeared to have been built by the “cleverest human brains in the body of ants.” I agree, and those are not trivial effects. GB Does it represent a way of life or a ‘great age’ that appeals to you? AG Yes, English style of the period does appeal to me greatly, and I would happily live in such a house—after clearing out some of the stuff, and getting a better sound-system than the wind-up gramophone. But not in the servants’ quarters, of course, and one has to remember that a house like this can work only as part of an abhorrent social system. This doesn’t make the Dolls’ House as pernicious a creation as Downton Abbey, because it is not engineered to make you believe a lie about the relation between masters and servants. Downton misrepresents the period in order to make you feel it wasn’t so bad, but it was. GB This was made at the same time as the art world was reacting against traditional forms of beauty, in the wake of the horrors of WWI. New art movements had been springing up all over the world from Vorticists, Constructivist, Futurists, etc. Do you think that in some ways this represents everything that they were reacting against? AG I think there was indeed a sense at the time that it was a monument to a passing age, though this had more to do with the society it miniaturised rather than that society’s taste in art. And, yes, new movements in the arts and decoration were indeed in part reacting to just this sort of style. I rather think that many people—and not just in Britain, where the cult of the pre-WW1 house has always been strong—hanker nostalgically for it. The house was built as a gift for Mary of Teck, who was not exactly avant garde in her taste, so it’s not surprising that its contents are uniformly conservative. It would be intriguing to know if any of the minority of artists who refused to contribute did so because they were unsympathetic to its aesthetic. George Bernard Shaw and John Masefield refused to provide books, and Elgar (unlike Delius, Holst, Bliss and many others) wouldn’t contribute musical scores for the library; but I don’t know why. GB Lucinda Lambton (in her book on the dolls’ house), describes it as “a flagship of endeavour to ease the nation’s woes.” Do you think that we should build more of these dolls’ houses in that case? AG National rebirth through a comprehensive programme of dolls’-house construction is not a plan with much political promise. It would, though, be fascinating and worthwhile to make a new one in ten years’ time for the centenary of the Dolls’ House. And it would have even more documentary value if the project included several simpler and more ordinary houses—as it should have done back in 1924. AG There are so many ways of being beautiful, some of which involve no action by any creature—not even combing your hair—that I rather despair of assembling any exhaustive set of qualifying attributes. I suppose one important necessary condition for beauty in an object is that it should delight some conscious being, or be capable of doing so. It does not even have to be the senses that it delights, since it seems fitting sometimes to call a person a beautiful one regardless of his or her appearance. For me, natural beauty comes in through the eyes, but artistic beauty mainly comes in through the ears. Music means much more to me than painting, sculpture or architecture, and I would rather go blind and be unable to visualise than be unable to hear or imagine sound. Maybe this is a defect of education: perhaps some people never learn to see a picture properly, just as many people never learn to appreciate classical music. Either way, I regard my aesthetic appreciation of sights as compromised or incomplete. Perhaps some people will see my choice of a dolls’ house as a sign of that.